Camping Domaine de Marcilly er en campingplads med 100 åbne pladser og 206 fastliggerpladser. I lavsæsonen under perioden 01-01-2019 - 30-06-2019 og 01-09-2019 - 30-12-2019, camperer du for €20,- per nat på en af de 100 åbne pladser på Camping Domaine de Marcilly i Marcilly-sur-Eure (Eure). På denne campingplads kan du, udover fordelagtig campering med dit CampingCard ACSI, også bruge dit ACSI Club ID (stedfortrædende identitet). Yderst smuk campingplads beliggende midt i en skov. Smukke afgrænsede områder, en dejlig (opvarmet) swimmingpool, 2 tennisbaner og en stor petanquebane. Receptionen er åben fra 09.00-12.00 og fra 14.00-18.00.
on arrival we had no problem pulling off the road up to the gate ensuring our caravan was fully off the road. Welcoming and helpful reception staff. We were given a number of pitches to choose from and chose a large pitch. all pitches were separated by mature hedges and very private with water available on pitch. Toilet block was clean and warm with paper and handwash available. Unable to comment of swimming pool and other facilities as not open this time of year. The village is about one mile away with a bakery and a few small shops. Larger supermarket at Anet. Approx 20 min drive. stayed for a 2 night stopover. Dog walks in the surrounding woods. Very friendly and helpful staff. Arranged bread for us every day even though the place was practically empty. Clearly the toilets have been renewed since previous comments as they were superb. Have to agree with previous comment about the gate being too close to the road for overhang - totally manic and so easily solved. Once inside there is plenty of room for all size units. But it\'s a bit like Hampton Court maze. I got lost a few times and we were the only unit there. Would recommend , but suggest phoning and asking for the front gat to be left open for caravans or M/homes with trailers! Expensive, poorly maintained site. Pitches overgrown, water switched off on pitch, toilets no 6 very poor with water flooding and bins no cleared. You get better facilities on a higher priced site. Only plus the swimming pool was good. Bizzarly there was a large bouncy castle near the pool but not a single child on site. Not worthy of a 4 star rating. Tatty overgrown pitches. No shop. No dog walking area. No facilities nearby. We saw people drive on to pitch and then immediately pack up and leave. Pitches sited amongst fixed holiday homes. Would not stay there again. Not worthy of even 1 star. Oh dear this site is tired. The swimming pool was good, but the patio near it for what we assumed was a closed down restaurant was moss covered and had many cracked paviers. The water feature was not working and looked awful. There were no signs as to where you take your recycling so you had to hunt them out. Likewise no signs as to the clothes washing. We did discover an unmarked door which revealed a washing machine (no cover on the water tank) and tumble dryer, but no hand washing sink. The showers were clean but just about hot, but the basins had nowhere to hang up a towel. Most certainly not worth. To enter the site you have to use a speaker to get the gate opened. Take care especially if you have a caravan as it will be out in the road as the drive is only a car's length to the gate. Goodness knows how you access this site if reception is shut as the main parking is the other side of the gate. If you have a prticularly long unit the gates are closed on arrival until you get admitted. The gates are close to the road and the tail end of your unit is left in the road, an accident waiting to happen. I was charged full price despite showing an ACSI card. Pitch was awful, electrics kept tripping even though we were hardly using any electricity. Well not enough to trip anything. Toilets absolutely disgusting, they were dirty when we arrived and had not been cleaned when we left the next day. Shabby pitches, untidy and unkempt generally. No friendly welcome a site to miss unless really desperate. Could not find what I would call a caravan pitch. What was there were huge pitches which had had old mobile homes removed from them and seemed to be waiting for someone to buy and install a new one. Very few electric hook up points and none of the water taps worked. Toilets excellent. Expensive for what it was. Campsite was very quiet for a Thursday and Friday night in August. Staff were extremely helpful - we arrived with one empty gas cylinder and an empty petrol stove. Whilst they did not have a cylinder to match they gave us some petrol but would not accept any payment. The pitch was very large with a picnic bench supplied and we had no problem erecting our two small mountain tents with aluminium pegs. We hired bicyles and went along a car free green trail through several villages that had a variety of lovely shops. Pool, tennis courts and bouncy castles kept our teenagers busy for the 2 days. Reasonable site for a stopover but very pedantic staff: they refused to accept an ACSI ID card and would not give the ACSI price without the actual discount card. 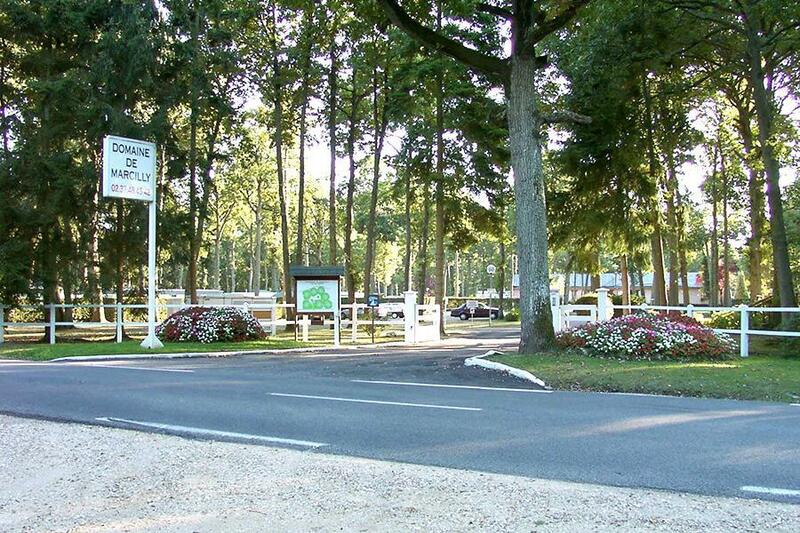 Vil du booke Camping Domaine de Marcilly eller have yderligere information? Det kan du via nedenstående oplysninger eller via campingpladsens hjemmeside. Kommende fra Dreux D928, drej efter ca. 15 km til venstre mod Marcilly. Følg så campingpladsskiltene. Fra Annet D928, drej efter 8 km til højre. Herefter er ruten som beskrevet ovenover. CampingCard ACSI sender din forespørgsel videre til "Camping Domaine de Marcilly".